WORLDWIDE: The cost of renewable power generation is already lower than fossil fuels, according to a new global analysis using levelised costs of electricity (LCOEs). The Carbon Tracker Initiative (CTI) also concluded that the commitments made in Paris last year will turn the tide further in favour of clean energy. As such, investors who base their decisions on coal and gas continuing to be the cheapest source of electricity could be "deeply misguided", the experts claimed. 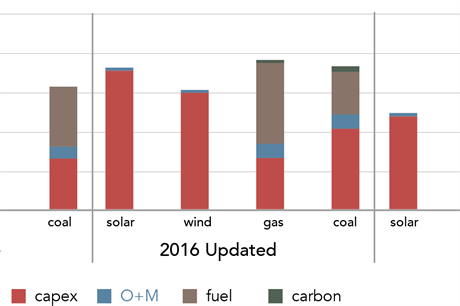 They noted: "... the global averages with real world 2016 assumptions tell us that already the average LCOEs for solar and wind are lower than their coal and gas competitors." Previous studies have suggested that renewable energy has become more economically viable, but it has been extremely difficult to determine whether solar and wind power, for example, are actually cheaper. The team of financial specialists at the CTI therefore used LCOEs to provide an up-to-date picture of what has become a "confusing" energy debate. The study compares the power-generation costs of four new-build coal, gas, wind and solar plants across three scenarios: the 2016 reference case scenario, an updated 2016 scenario using LCOEs and a 2020 2C pathway setting — where investment decisions take into account decarbonisation trends. The results showed how reduced load factors and shorter lifetimes for coal and gas plants in a world that is decarbonising steadily can "significantly undermine plant economics". For example, typical plant utilisation rates used by industry in reference case scenarios are around 80% for coal and 60% for gas. However, 2013 data shows that global average plant capacity factors were 59% and 38% respectively. By 2020 these capacity figures will fall even further, to 42% and 31% respectively, as more policies to keep temperature rises below 2C kick in. Costs for coal and gas will increase whilst those for solar and wind could fall as capacity factors rise. LCOEs for solar in CTI's updated 2016 scenario, for example, are $72.88/MWh, compared to $79.1/MWh in the reference scenario. By comparison, the figures for coal are $74.97/MWh and $54.46/MWh in the respective scenarios. The implementation of nationally determined contributions post-2020, under the Paris agreement 2015, will make renewables more cost-competitive on average — even if fossil fuel prices fall and carbon prices are modest at around $10/tCO2 or lower, the experts said. In the 2020 2C pathway setting, solar and wind fall to $49.84/MWh and $43.65/MWh, whilst gas and coal rise to $88.46/MWh and $101.58/MWh respectively. In their 2020 scenario, even very low fuel prices would not tip the advantage back to fossil fuels, they said. "This suggests that the tide has turned, and is borne out by the growing number of locations where unsubsidised renewables are being built." The authors admitted there are "large ranges of values for each technology" when using LCOEs and a definitive answer is not possible. However, their study highlights how a series of "modest incremental changes" to average LCOE assumptions can have a "profound cumulative impact on the affordability of power generation technologies". "You have to chew gum and walk at the same time"